There are a number of reasons to store your vehicle in a self storage unit. Whether you are storing it during the home selling process, over the cold winter months, or as you are transitioning from a move, there are a number of reasons a storage unit may be the best place for your car, truck, van, SUV, RV, camper, boat, motorcycle, or bike. Did you know that over a 10 year average, studies showed that nearly ¼ of vehicle crashes were weather-related? As the weather gets worse during the coldest time of year, the number of weather-related accidents and injuries increases dramatically. Make sure to drive your safest vehicle throughout the winter season, one that can safely maneuver the slick, icy roads. Consider carpooling or taking public transportation to cut down on driving during this time of year. 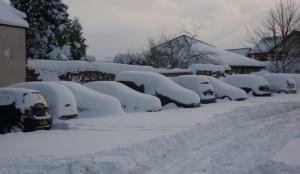 If your vehicle isn’t up to the harsh driving conditions, consider storing it for the winter. While it may seem more convenient to leave your vehicle in the garage or driveway, snow removal treatments, like salt, can create rust and eat away at the body of your vehicle. Keeping your car in storage will ensure it is safe and away from the harsh weather elements. Measure the size of your vehicle so you know which storage unit is right for you. Indoor storage is usually ideal because it can protect your vehicle from things like corrosion and sun damage. Climate controlled vehicle storage units are usually the best option because they will maintain the perfect temperature and conditions for your vehicle. If you opt for traditional storage instead, you may need to remove the car battery and store it in a warm place. For an extended stay, you may want to hoist your tires off the ground using jacks or blocks to avoid flat-spotting the tires. Change the filter and ensure you have fresh fluids, such as the oil, gas, antifreeze, transmission, rear axle, and power steering fluid. Setting the air conditioner to “recirculate” can help seal the ventilation system from the outside, which can prevent bugs from entering the vehicle through the HVAC ducts. You may want to invest in a car cover to keep your vehicle clean and free of dust and moisture. Disengage the parking brake to ensure it does not cause future issues once you take the vehicle out of storage. With Value Store It, you can rent a space for as long as you need it, without any long-term contracts. For the small cost of storing your vehicle, you can see big benefits and your car won’t have to suffer a beating throughout the brutal winter months. Contact Value Store It to rent a unit or for more information on the benefits of storing your vehicle.